Puzzling Queen: Fantastic mail again! I had been waiting for this mail and yesterday it finally came. I had heard from a Canadian friend that he was able to buy it in a local store, but to me that will be impossible. 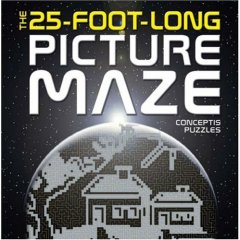 The newest book with Conceptis puzzles is fascinating. 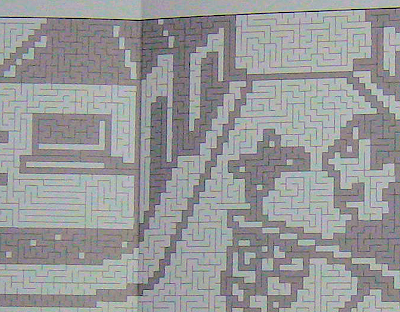 In general mazes are easy to solve, but this is 25-foot long! The puzzle is folded in a hard cover. When you open it, you can see what can be read on the back cover: To get the whole puzzle, you need to complete the whole puzzle. If I seem to be missing for a few days, you can imagine what I am up to! Unique gift idea! Thanks. Looking forward to buy one of these! Wow! May I ask how you got that? I've never seen MAPs in books. My gosh, that's massive! Have fun!!! Doing Maze is wonderful activity that activate our brain and tests our stamina as well as determination. The benefits they provide can be seen through the numerous exciting maze sold. The one in this post surprises me of its extend. Maze is getting challenging. Good! This great maze do excites most people. Most importantly, I believe, it helps to make others better especially in the planning and logical thinking skill. Thanks for the sharing. Your site on maze really give me a different perspection to it. Great! hope you are using a pencil and eraser. ;) I am curious about the strategies for such a large maze?